Why are so many people talking about CNN, Reddit, and Han Solo? 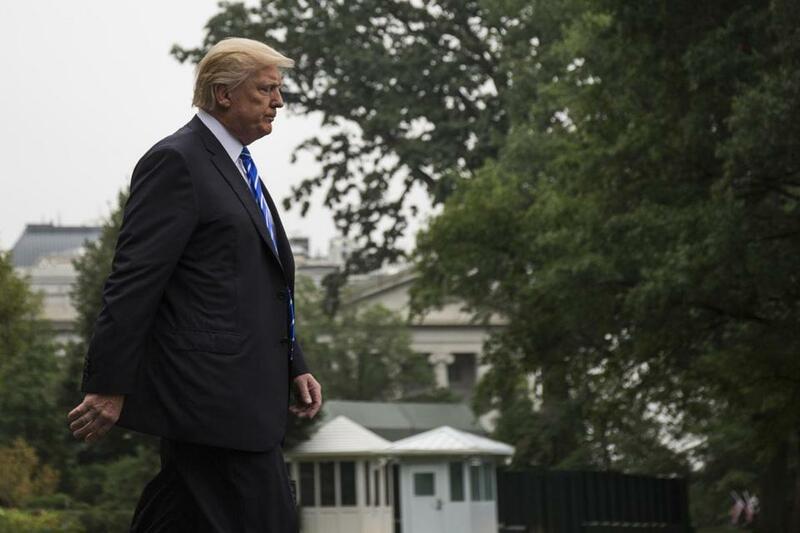 President Donald Trump walked to Marine One before departing from the South Lawn. In the days since President Trump tweeted a video depicting him wrestling a man bearing the CNN logo, the focus has turned to the Reddit user who created the image. But CNN is now facing backlash from Trump supporters for its recent story on the issue. So how did it all unfold? Over the weekend, Trump tweeted a video that was condemned by some as condoning violence against journalists. A Reddit user, known as “HanA--holeSolo,” claimed credit for creating the gif that inspired the video, writing that he was “honored” that the president used his gif, according to CNN. Monday, the Guardian reported that the user had a history of making racist and offensive posts, often using racial slurs and advocating violence against Muslims. Also Monday, a CNN journalist discovered the man’s identity using details from his previous Reddit posts, contacted him seeking comment, but did not publish his name. On Tuesday, the Reddit user posted a lengthy apology for creating the gif shared by Trump. He also warned others against spreading hateful messages online. The apology was later removed, according to CNN. A day later, CNN published an interview with the man, but declined to name him. The story indicated CNN could change its mind and name him if he continued to make offensive posts online. What are Trump supporters angry about? Since then, a number of Reddit and Twitter users have accused CNN of threatening to identify the man if he continued to post offensive messages. But the author of the story, Andrew Kaczynski, said on Twitter that a portion of the story saying that CNN “reserves the right to publish his identity” was being misinterpreted. “It was intended only to mean we made no agreement w/the man about his identity,” he wrote. Twitter users, including the president’s son, have also claimed that the user was a minor, but Kaczynski said he’s actually a middle-aged man. “Any assertion that the network blackmailed or coerced him is false. The user, who is an adult male, not a 15-year-old boy, apologized and deleted his account before ever speaking with our reporter. CNN never made any deal, of any kind, with the user. In fact, CNN included its decision to withhold the user’s identity in an effort to be completely transparent that there was no deal,” the statement said. Kaczynski has accused Trump’s son, Donald Trump, Jr., of spreading misinformation by claiming the person behind HanA--holeSolo is 15 years old. Meanwhile, the HanA--holeSolo account has been deleted. Twitter users, many of whom are Trump supporters, are continuing their campaign against Kaczynski and CNN, and as of midday Wednesday the hashtag #CNNBlackmail was trending. Also Wednesday, Senator Ted Cruz appeared to suggest CNN could be guilty of extortion over the incident.